The author in Hawaii in 1993. This is one of a series of personal paranormal stories I will relate here on the GRI site for posterity. In no way are these being submitted as “evidence”. The stories I am sharing are personal experiences and stories as told by me and I swear that these events really occurred as related. With it being Mother’s Day as I write this article and with all the stories of Hawaii in the news these days, I was reminded of a trip I took to the islands in which I had a couple of very strange paranormal encounters. In the early 1990s, I took a series of trips to the Hawaiian islands. One of my favorite island visits was my trip to the Big Island where I spent a week exploring the island and taking in the sights. For several days, I made the 80 mile drive from Kona to the Kilauea and explored the volcanic vents, even witnessing the lava flowing across an old section of road at one point in my explorations. 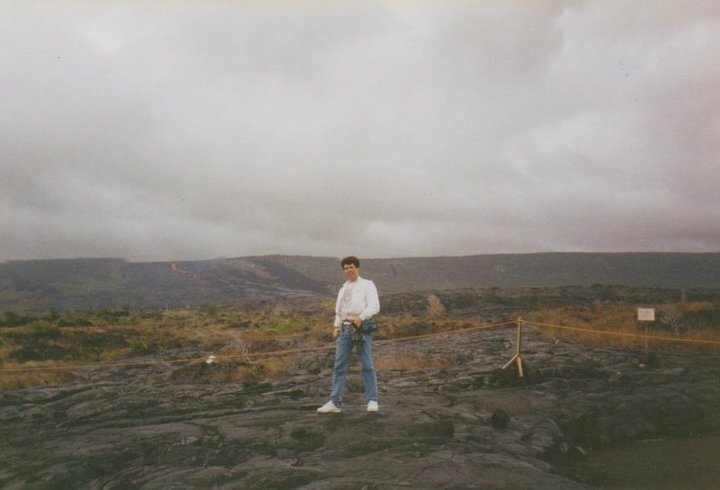 Me in 1993, standing on fresh lava near the ocean on the Big Island. I spent one day hiking across a significant portion of the upper crater area near Kilauea’s volcanic vent and saw the lake of lava for myself and decided to do as the natives did and to leave a small offering of a candle and a prayer to Pele as a sign of respect. Not being native to the islands, I was simply giving a tip of the hat to a force of Nature whose presence one can feel just by looking around at the living landscape that makes up the islands. Never did I imagine that this force and spirit might give me a tip of the hat in return. Twice. 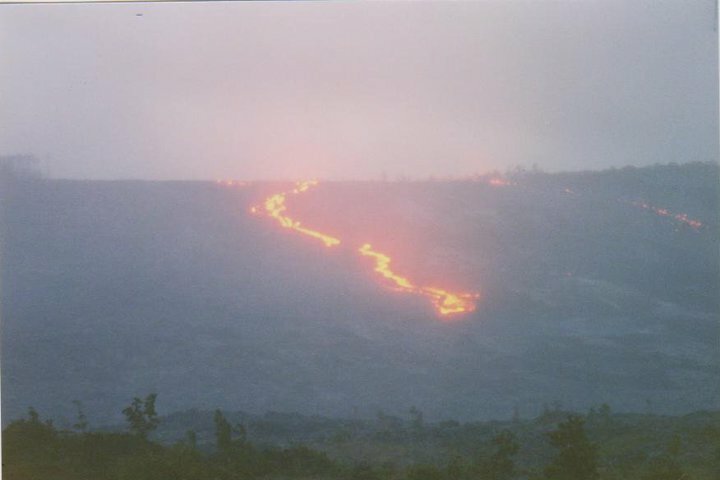 View of the main vent at Kilauea Iki. Note the steep grade where I almost fell in. 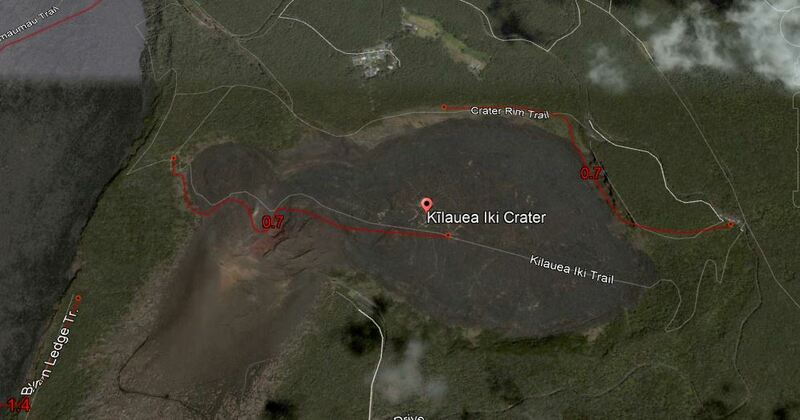 After I left my offering at the summit of Kilauea, I hiked down into Kilauea Iki, a smaller volcanic cone next to the big lava lake and was standing at the actual vent where Kilauea Iki last erupted in 1959. There is a sign there to be careful not to get too close which I, unfortunately, did not heed. I was trying to get a look into the vent and ventured just a little too close. My footing gave way and I began to slide straight down the hill into the chasm leading down into the vent. I had nothing to grab onto and was literally in the first moment of falling in. The strangest thing happened at that very instant. I was literally shoved back by a very strong gust of wind, almost as if I had been snatched back. I fell on my back and held my camera in my hand and was a little shocked at what had happened. I slowly backed out and got to a safe spot and gave a silent prayer of thanks for still being alive. If I had fallen into that vent, I have no idea what would have happened… Badly injured at the least and if I had fallen into the vent hole, I would never have been found. I had the strange thought at the time that I had been saved by Pele and made sure to take no more chances at the volcano from then on. The Goddess Pele is a fact of life on the Islands and people visiting the islands should never mock the belief in this deity. Strange things happen in Hawaii and many a tale of paranormal encounters have come about from people who previously doubted Pele’s existence or mocked the ways of the native people who are very connected to the island mysteries. 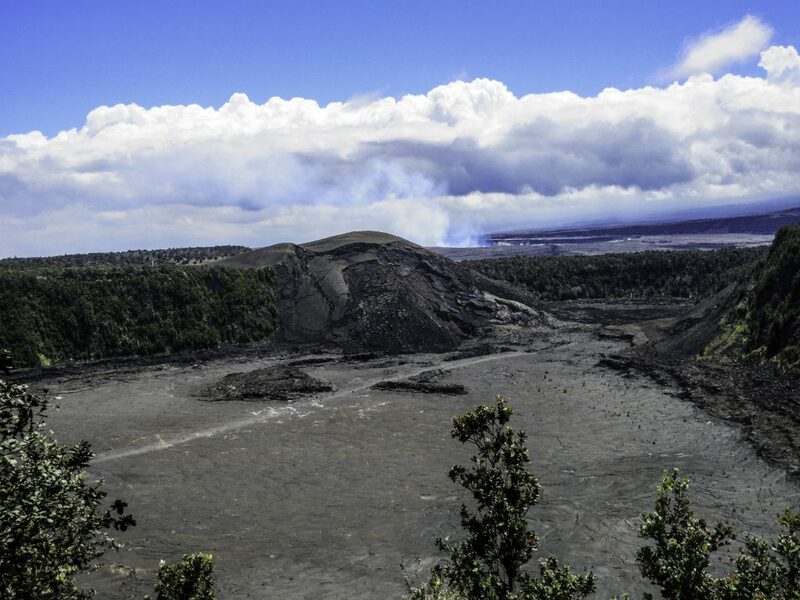 The Native Hawaiian people are very keyed into her and view her eruptions as spiritual in nature. They even wax philosophically about her taking homes and land, citing that Pele created the island and can take what she wishes. It is up to we Humans to get out of her way. It would do we mainland folks well if we listened to the Hawaiian people’s stories and gave them more credence. One day I will return to the islands to experience more of what they have to offer and to talk with the Native people. From my own paranormal research over the past ten years, entities like Pele are very real elemental forces that do have intelligence and are not to be dismissed as fantasy. They are most certainly real and living beings with great power. And I most certainly believe I had two very direct example’s of Pele’s power demonstrated to me firsthand. Lava making it’s way down from Kilauea to the sea. The smells of sulfur and burning vegetation were overwhelming. I stayed one evening at the volcano well into the night to witness the lava glowing next to the sea and it was a sight I will never forget. The eruption flowing downhill that is shown in the photo above was captured near sunset and I was transfixed as forests burned away as the lava made it’s way down the mountain and drained into underground lava tubes and poured into the sea. You can’t imagine such a sight… It has to be experienced in person to fully appreciate the sheer spectacle of seeing these great forces at work. 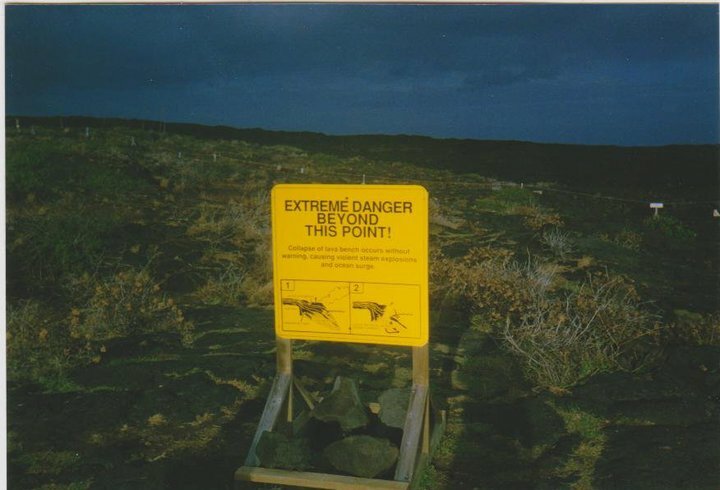 Warning sign to NOT go into the lava fields without professionals to guide you. 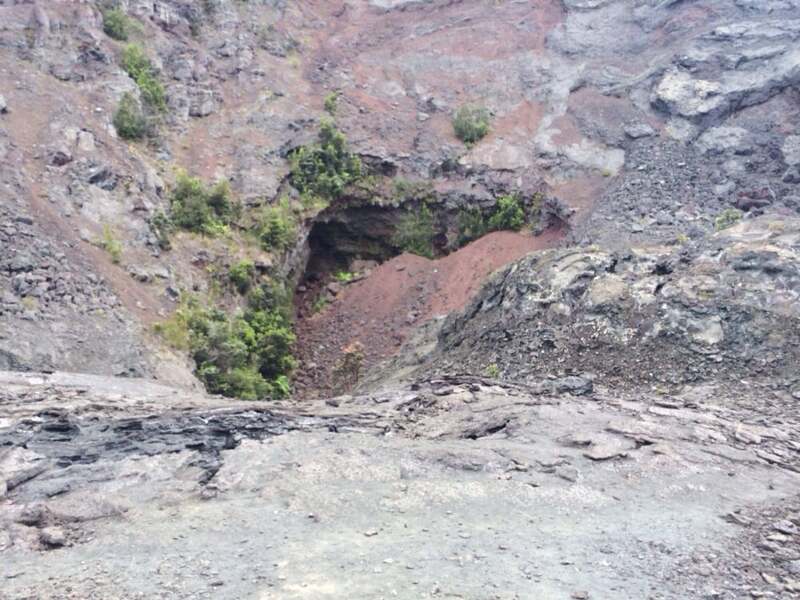 The dangers of the being near lava that is flowing are very real and I was given a chance to walk closer to the flows on one of the days I went to the ocean where the lava poured in. And for those who do visit these places, trust me, you should NEVER go in without an experienced professional guide. You can all too easily lose your life with one wrong step. The USGS/ranger/geologist who I happened to run into was very nice and she took me in to witness the flow from a short distance away. The heat and fumes were intense and we stayed for about 10 minutes before being warned to get out before lava encircled us. We were more than glad to exit, but got some amazing photographs of the activity. Lava burning the old subdivision road on the southern flank of the volcano. 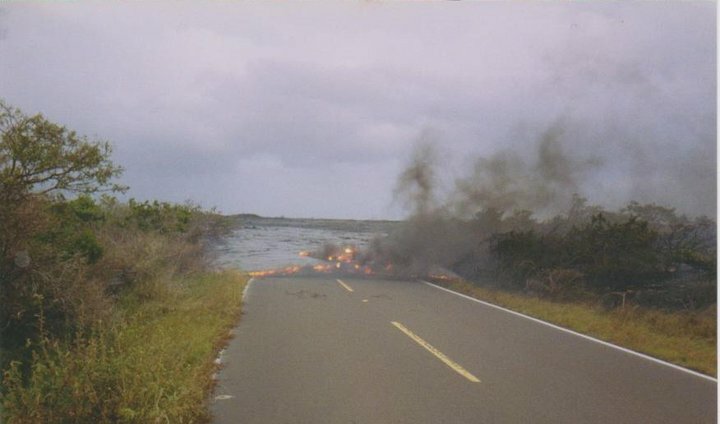 Note the smoke from the asphalt burning. I managed to get a little closer, but the hea and fumes were overwhelming. 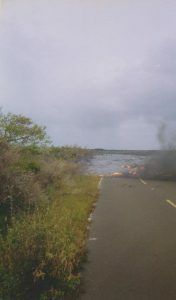 The lava flowed across the road in slow motion, crackling and pouring out bubbling asphalt smoke as the road literally burned from the intense heat. I have never seen such a sight since and feel very privileged to have witnessed this amazing sight in person. The USGS geologist/ranger who happened to be there was taking folks in to the lava flows was very informative and smiled when I asked her about Pele. She said she believed in The Goddess and had a number of strange stories of her own from her time on the island. She also made sure to impress on me how lucky I was to get this close to the lava flowing and said very few of the many visitors to the island get this kind of a chance. I did feel very lucky to have seen it with my own eyes. If I remember right, she said that one in every 5,000 visitors to the island gets to see what we saw. After witnessing the lava at night and having given my offering to Pele up on the main volcano earlier that day, I slowly made my way back to the main road, Highway 11, and drove my convertible rental back to where I was staying in Kona. Not long after I passed the area where Pahala is now, I had the music playing and was just enjoying my night drive back to the bed and breakfast I was staying at when I spotted a woman on the side of the road in the distance with my high beams on. There was no traffic that night and I was the only car on the road. The woman kept walking up the grade next to the road. She was older with grayish hair and slightly stooped, moving slowly on the right side of the road, making a little room for me to pass her. I slowed and saw she wore a green and blue muumuu which covered her frail form. It was nearly 10:30 or so at night and the stretch of road I was on was such that we were far from any human habitation I could spot, other than the occasional macadamia farm. I continued to slow and became concerned for this woman being so far from any help in the dead of night. So I found a wide spot on the right just ahead of her and pulled off to see if I could offer this lady a ride. Realize this; As I passed her, I looked right at her and she looked at me and slightly smiled. She had very piercing eyes. I couldn’t see features of her face because there was only ambient light from my car side illumination as the evening was pitch black, save for the car and the barest sliver of a moon that was still up. Still, there was a brief moment of communication between us as I slowly passed her and look directly at her. I can’t imagine how I looked to her, but I think surprised was the emotion I was feeling. So imagine my amazement as I got out of the car after parking only twenty or so feet ahead of her and turned and said “Ma’am can I help you?” and was looking at empty space. No one was there. I scrambled around and looked at both sides of the road and circled the car to see if she was hiding near it. There was NO ONE there! And there was no place she could have gone! No trees, hills or brush to hide behind. Just a wide flat spot and a field to the right that was wide open with a hill up on the right. And behind me was open space heading out some distance to the seashore. She literally had up and disappeared on me! I stood feeling rather spooked and perplexed and realized that this was likely some kind of ghost sighting. It was early in my life where I hadn’t yet dealt with paranormal matters as an investigator, but had dealt with ghosts and spirits on a number of occasions due to my family history of living in some very haunted places. I had that odd feeling of being laughed at and the sensation of being watched and yet was not scared. In truth, I hoped I hadn’t missed seeing the old woman and had left a real flesh and blood lady in the lurch out on that lonely stretch of Hawaiian road. In my heart, I knew she had never been there as a mortal woman. She was something else. I got back in the car and pulled away, feeling a mixture of emotions, but mostly being confused and a little spooked at what had looked like a real flesh and blood woman one second and then empty space the next. 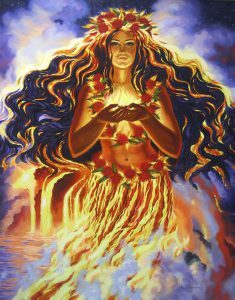 Pele is the Hawaiian goddess of fire, lightning, wind, and volcanoes as well as the creator of the Hawaiian islands. Pele also carries a staff, which she uses to know if the ground is dry. I did not see a staff, but it was night and she DID appear to be hunched over when I saw her. And she is well known to appear to we mortal folks as either a young woman or an older woman. I had briefly heard some of these tales of how she appears to people on my trips to the islands, but had never given them much thought beyond my respectful offering up at the volcano summit. Having mentioned that Pele is the goddess of not only fire, but of lightning and wind, I cannot help but think that the wind that shoved me back from a nasty fall at Kilauea Iki was of her doing. The next morning at breakfast, I mentioned my unusual sighting of the prior night and my near fall into the volcanic vent to my hosts at the bed and breakfast. They were an older retired couple and they looked at me in astonishment. I asked what was wrong. I told him about my offering on the summit of the volcano and he and his wife plus the other guests smiled. We all agreed it was a really nice experience and I was left with a beautiful memory of the island, a mystical experience I shall never forget and and paranormal experience that I am but one of many to have had. 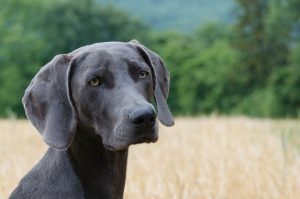 “If you are driving along Saddle Road (Highway 11), and you see a either a young and beautiful, or older woman with long white hair, who may or may not have a dog with her, you are supposed to pick her up, because she is actually the goddess Pele in disguise. If you don’t, the next time the volcano is erupting, your house will be destroyed by the lava. And it doesn’t end there. Pele can also visit people in their homes as quoted in Hawaii Life. “There are many stories and lots of news articles in the past that speak of the Legend of Pele and the Law of Hospitality. As the local legend goes, when you see a beautiful Hawaiian lady with long hair, or an old lady with long, white hair dressed in a white robe, walking with a white dog—offer to give her a ride—and if she comes walking up to your house, treat her with respect like family and offer her something to eat and drink, and a place to relax. The legend is that Pele will give favor to anyone who treats her with Aloha, and when it is time for her lava to flow, your family and your property will be protected. 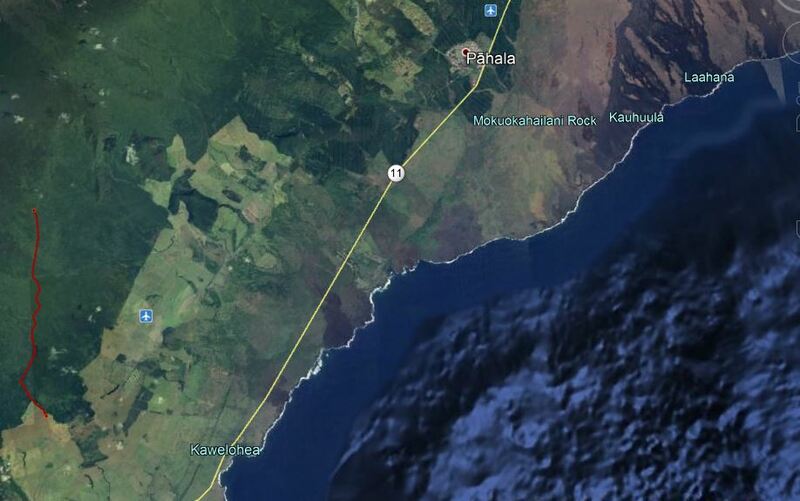 My only advice to those traveling to the Big Island is this: If you see a young woman or old woman along Highway 11 in Hawaii, all alone and needing a ride, stop and be nice to her. You may well be in the presence of a powerful Goddess who will likely give you amazing blessings if your heart and mind are in the right place. And if you are at the Volcano National Park, leave an offering for Pele in the form of a bottle of gin, flowers, fruits. You’ll be creating good karma and giving Pele the respect She deserves. Case Notes: I attempted twice to report this case the BFRO as a courtesy to their team but no one at BFRO responded and I felt compelled to go ahead and publish this on my site since I want it in the record that it happened to members of my family back in the 1960s and it changed their lives and perceptions of the forests of Northern California forever. This is a true story and whether or not the BFRO believes it, the story will be told for posterity. 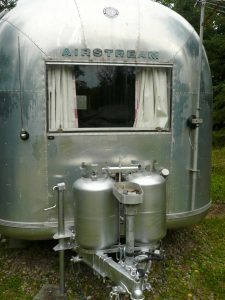 It was fall of 1964 and my Uncle Ernie had taken a large Airstream trailer up to the Klammath river somewhere in the extreme northern portion of California to catch salmon at the river. A number of men joined forces to hunt, train their dogs and fish while enjoying the great outdoors. My guess is that this was in Siskiyou County where the events of that evening took place. All of the men who witnessed these events have long since passed. The last of them being my grandfather in 2011. My mother recalls the terror in the faces of these men when they returned from this expedition and it was clear they had the fright of their lives. There were a total of four fishermen with two of them being my grandfather and my Uncle Ernie. Another friend who owned a car repair place in Roseville, California was with them and his name was Red (we won’t put the last name here for reasons of privacy). The entire team had a good day fishing and came home for the night with a lot of salmon, which they stored in large metal ice chests. The chests were pushed up under the trailer and the men were not too concerned about bears going for the salmon because they had dogs with them on this expedition. The dogs were locked in a camper and would bark if anything disturbed the camp. All of the men carried deer rifles and pistols. These were experienced woodsmen and they knew their weapons inside and out and were all good marksmen. Sometime in the middle of the night, around 12am to 1am, the men awoke to a sudden and violent rocking of the trailer. Mind you, this was a 20 to 25 foot Airstream trailer with five men and all their gear in the rig that something was shaking with extreme violence from side to side. The men panicked and were trying to grab guns and get outside to confront whatever was doing this. The shaking continued for some time and then stopped when the creature got to the salmon in the ice chests. It peeled the steel lids of the ice chests off and stole the salmon and took off running. I have actually stayed in this trailer for some months as we built our current home here in Shingle Springs, California. It was a large trailer. For something to have shaken this trailer like this, it had to be absolutely huge. By that point the dogs were going crazy and the creature took off with the fish. The men rushed out and saw the creature heading for the hills carrying stringers of the salmon with it. My grandfather related that the stench was unbelievable when they got outside and found tracks and saw the damage to their ice chests. One of the men released the dogs, who were in the back of the truck camper and all four dogs tore out after the creature. Now before you criticize the story about the dogs chasing this creature when most dogs react in fear of Sasquatch, I am relating the story as I was told it. And these dogs were trained hunting dogs and did as they were told to by their owner. So don’t shoot the messenger since I’m telling a story that only a very few people alive remember, but the character of these men and their fear and emotion on telling the tale should speak volumes. These men began to follow the dogs, but were unsure as to what they were hunting when they stopped and heard the dogs screaming. As they ran towards the direction where the screams were happening, the noises suddenly stopped and it was all quiet. They continued on and eventually ran into two of the dogs that were injured and which were coming back towards the men. Those two dogs ran for the camper and jumped in and wouldn’t come out while whimpering from their injuries. The men continued forward up the hillside where this creature ran into the forest. Eventually, they ran into pools of blood and parts of the other two dogs laying on the ground and then noted blood dripping from the trees. They looked up and saw the remains of the two dogs ripped to shreds and parts hanging in the trees. It scared them so bad, they retreated back and packed up and got out of there. They noted the tracks and their camp area had been ripped to shreds by this thing. They noted the bad stench at the camp which lasted for quite some time after the encounter, while they packed to get out. It was clear that this Sasquatch was trying to get to the salmon, but I find the shaking the trailer aspect mystifying. I’m no expert on matters Bigfoot… my expertise is in paranormal phenomena, but we do see territorial displays in our own work and I suspect this might have been one on the part of this creature. My grandfather passed away in October of 2011. All of the other men, my uncle included passed on long before that. Three of these men were woodsmen and had lived in the Sierras their entire lives. Our family history goes back over 150 years in this state. I have had my several of my own encounters with these creatures over four decades, but I have not seen one of these creatures as clearly as these men did. My grandfather was very clear that he didn’t see this thing up close but did see it running up hill with the fish at speed at a distance and it was absolutely huge. All of the men there saw the tracks and the sheer power of what these creatures can do. And they will kill if confronted by dogs. I’ve heard this story repeated by various family members for over 40 years now. It has never changed. And I heard it told by my grandfather in person several times. The look on his face was one of sheer respect and even fear as he told the story. The thing is, my grandfather was one experienced hunter. He shot one of the largest moose ever documented with a total weight of over one ton and a thirteen foot rack in Alaska. He was very familiar with bears, having hunted them and shooting a huge grizzly that ambushed him during the moose hunt. He was one of the best outdoorsmen I have ever known. And my grandfather, as well as all of the other three never would set foot in the Klammath area ever again. They were not surprised when all the other events that transpired afterwards in that area began to make the news. These were tough guys. It took something extraordinary to scare them into not feeling comfortable in an environment that they grew up in and would never have given a second thought otherwise. The man nicknamed Red refused to ever go to the mountains again after that. It takes something horrific to scare a lifelong woodsman from the place he loved to go. 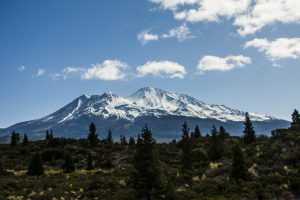 Our whole family has steered clear of that area since then except for me visiting the Mount Shasta area and having my own unusual encounter with something while fishing there in the early 1990s near Castle Craggs near Mount Shasta. Something huge lives up there in that part of Northern California and it isn’t above attacking and killing to get what it wants. 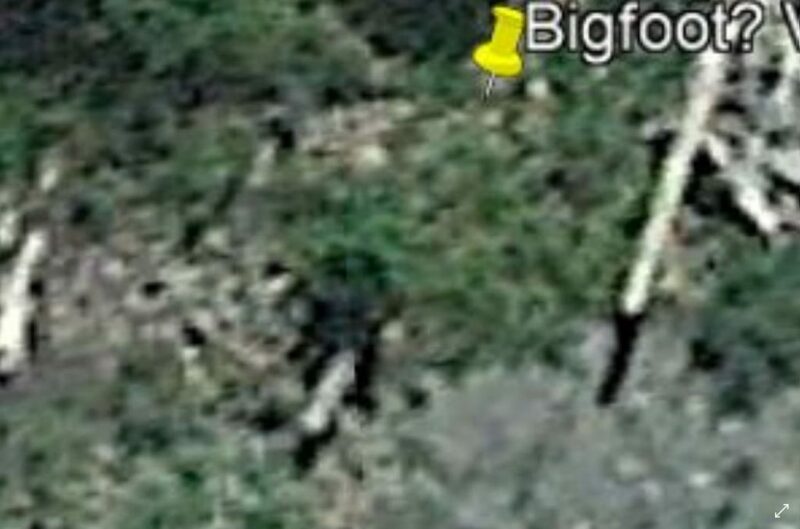 Satellite photo of possible Bigfoot taken in July 2015 near the Klammath river. Creature is sitting on the log and is estimated to be between 12 to 15 feet tall. 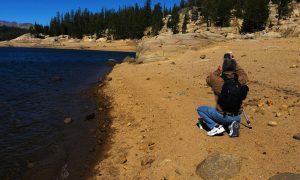 I normally do not pay much attention to Bigfoot or Sasquatch material, but of late I’ve had to address the fact that I have had more than one encounter with this creature, the most recent being in September of 2017 near Lake Tahoe. And I began to research this creature, which I know to be real and began to realize there are common themes to all of the sightings. A large proportion of these events come about because people do all the wrong things to get a Sasquatch to react or become violent and threatening. It is this article’s purpose to explore ways to avoid conflict with this creature. Before we get into this guide: I make no claims to be a Sasquatch/Bigfoot expert and am only using reasonable supposition to draw my conclusions after hearing countless stories of the interactions these creatures have had with humans and a number of my own encounters with what I believe to be this creature. I am more than willing to consider other opinions, but what I have YET to see is any simple guide for human beings to follow when it comes to how to deal with the Sasquatch (Forest People) or creatures related to Sasquatch and how to prevent or end an encounter as peacefully as possible. So I am creating this guide to hopefully get a discussion going and to give people at least SOMETHING to work with as a guide when out in the woods. And do note this is not a politically correct article. I believe political correctness to be the practice of watering down truths so that the weak-minded person’s sensibilities are not offended because they can’t handle the truth. I care not if I offend. I offer information and some of it is harsh, direct and based in reality which doesn’t recognize PC weakness. If you can handle reality, then this article is for you. If you can’t handle it, then stop here and go surf a PC site where you can continue to live in your version of reality without fear of having your cherished beliefs challenged. In reading up on and viewing video of cases where people have had run-ins with Sasquatch creatures, I have noticed repeated trends that indicate that these creatures react to perceived incursions into their territory and that they generally engage in an escalating series of warnings that can progress in ferocity and violence up to the point of killing one or more humans to achieve their aim of being left alone. This is a pattern one sees with many creatures and it isn’t surprising to see Sasquatch engage in it as well. 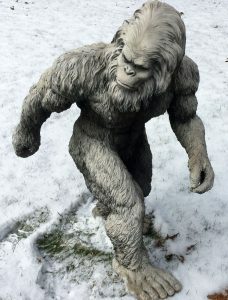 These cases of negative encounters usually come about from humans exhibiting a lack of situational awareness and the point of this article is to try to educate people to respect the warning signs that Sasquatch, Bigfoot, Yowies and the countless other names these creatures are known by are in the area and how to avoid a potentially deadly encounter. My own encounters have all ended peacefully because I respected the boundaries and played by their rules when I realized that I am in an area they are frequenting at the time. Most of them simply wish to be left alone and is it too much to give them their space once you are made aware they are in the area? In one case, forty years ago, I was actually “herded” out of a fishing spot I was in very expertly and peacefully by what I believe to be a Sasquatch. Once I became aware of being in the presence of this creature, I retreated and it simply paced me out of the area, on the opposite side of the river I had been fishing at, out of sight for the most part, but revealing itself just enough to let me know I was dealing with something highly unusual. In another case three decades ago, I was again fishing, this time near Castle Craggs, California. I had that same feeling of being watched and it got so unnerving that I backed off, stopped fishing and went to an open area and was picked up shortly thereafter by a friend of mine who had dropped me off there to fish. Once the truck began to arrive to pick me up, the feeling of being watched immediately went away. The bottom line for not having a negative interaction? It is all about Situational Awareness. Was it a Sasquatch that watched me fish? I believe it was. There is something different in the way people react when watched by them versus being seen by a bear, big cat or other predator. I can’t pin down why, but I’ve learned to trust my instincts and I do believe what I was being watched by was a Sasquatch. I offer my first attempt at a guide of sorts for people to consider. This rule set will likely flex and change as I learn more over time and listen to other opinions. If you are going to an area to camp, fish, hike or even live, be aware of the nature and frequency of reported sightings of Sasquatch and other predators in the area. Avoid those areas or, if the sightings only happen at certain times of year, avoid them then. My own cases have ALL been in late summer and early fall and I have learned to avoid going out into certain areas of the Sierras where I live during these times. 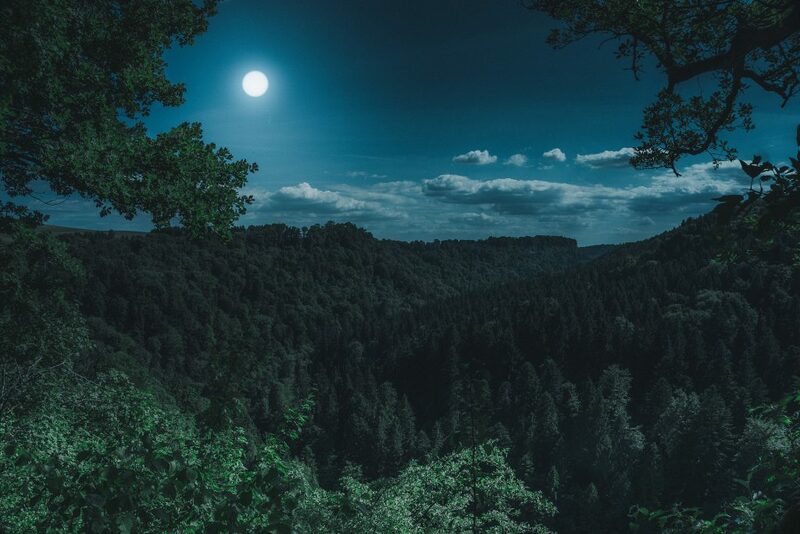 If, while hiking, camping or working/relaxing in an area, you begin to hear wood knocks, trees falling, screams or even witness a creature, vacate the area immediately. Make your intentions clear that you are retreating. Such respect shown to these intelligent creatures may even save your life. When hiking and moving through the outdoors, pay attention for signs of Sasquatch. The signs include broken trees at higher than normal heights than other creatures can create, strange over-sized structures that are out of place, trees across roads and paths with obvious signs of Sasquatch having done this, broken trees pointing at a approximately 45 to 90 degree angle which indicate that you are at an advertised boundary and from which you should immediately back off and respect the boundary line. Look for other such trees as good indicators of the boundary being truly a Sasquatch territorial sign and if you spot these, leave immediately. Look for tree signs with X shapes or other obvious signs. Do not hang around. Other signs can include full grown trees impaled upside down in the ground, destroyed areas that no human activity could ever be attributed to and, of course, footprints. If you see one or more of these signs, it is time to go. Do not invite a challenge or force the creatures to react to you unless you accept the consequences. It is your personal responsibility. If you experience rocks being thrown at you and can vacate the area, leave as soon as possible. This is a sign by the creatures to leave and that you are WAY too close. If it is night time and you can’t easily leave, simply stand up and tell the creatures in plain English that you mean no harm and that you will leave at first light. There is some evidence that they do understand some or all English in many reported cases. In any case, break camp and exit at the first possible opportunity. If the attacks continue, use best judgment and exit immediately if there is no other choice. Your life is worth more than staying put. Some Sasquatch may view collection of food items in the forest, such as fish or pine cones as an attack on their territory and may react to protect their food stocks. Be aware of this before blindly taking food that they may consider theirs. If you have played by all of the rules above and still find yourself in a situation where a Sasquatch is either attacking, bluff charging you or even invading your camp, stand your ground, face the creature(s) and back away if possible, speaking softly and indicating you are retreating or will leave. In some cases, this will NOT work and you will have to run or defend yourself. If armed with a rifle or pistol, make it plainly evident you have such defenses and only use them if attacked and there is no other choice. 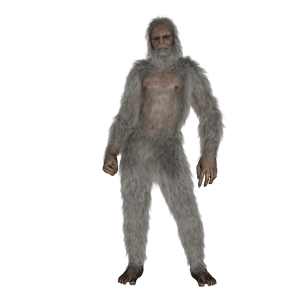 Sasquatch are opportunists and will sometimes raid your camp for food. It is likely that Forest Service and Fish and Game personnel are all too aware of the population of these creatures in the area and you may want to insure there have been no sightings in the area before choosing a place to camp and bringing a lot of food with you. Use common sense. Store food in bear-proof containers and remain situationally aware at all times. In September of 2017, a Sasquatch approached our camp and came right up to the van we were sleeping in with our food stored inside and made a provocative move which we responded to by immediately turning on all the lights and going outside to confront it. No other incursions happened, but we had the distinct feeling of being watched for the remainder of our time there. At the time, we thought it was a person who had violated our space and only later did we spot signs in the daylight of it having been a Sasquatch. Again, we were in it’s territory and at a time of year most people had left the forest. It was we who were out of turn staying where we had been staying at that time of year. We took the lesson to heart and won’t be back there in the fall for overnight trips. 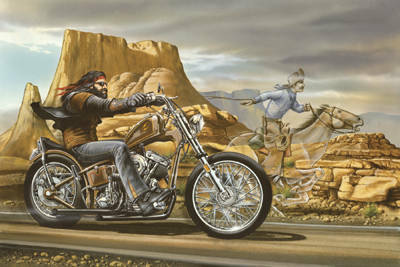 When the inevitable chance encounter does happen, most Sasquatch immediately turn and seek cover and distance. This is seen time and again in many videos. It is a surprising thing to see one of these creatures and it is my theory that if humans simply put up a hand as a gesture of peace and immediately turn and leave the other direction, these creatures may come to associate the hand gesture with humans respecting them and they may perhaps return the sign. There have been cases of these creatures doing just that when given the universal sign of greeting and I believe that more of this behavior would engender good relations and an understanding between species. 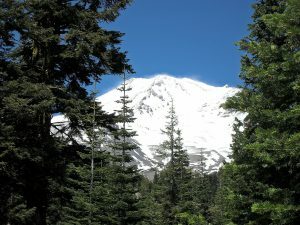 In my first encounter with a Sasquatch as a teenager, when I became aware of being watched by something as I fished the Feather River, I immediately picked up my gear and began a steady retreat and I feel that the creature realized I was aware of it’s presence and was giving it respect by my peaceful departure. Simple respect is what gives a good outcome to such cases. Realize that there are even cases of friendly Sasquatch playing at their dealings with people and some do seek out contact with us. These are exceptional cases and while rare, do indicate there is some measure of good will that they can extend to us. It is just prudent to be cautious in these unique circumstances. Some are curious and will even visit homes and even develop an affinity for certain people who treat them with kindness and even gifts of food and trinkets. There is much debate as to if this should be done or not, but the simple fact is that these interactions DO occur and there is some degree of affection and even trade that occurs in a friendly manner. I leave it to others to debate the ethics of these interactions. 8. NOT ALL SASQUATCH ARE GOOD. SOME ARE KILLERS. ACCEPT IT. There are, just as with people, good and bad Sasquatch. Some of them are just plain nasty and it is absolutely clear that the governments around the world, where these things live, have dealt with them with military force to get them under control. There is little that can be done by the average citizen to stop an attack by such a creature, short of carrying a firearm in the forest and that is the only chance the ordinary citizen has to stop an attack. There are those who will take exception to this reality, but the hard facts are often hard for idealists to face and it is up to the individual to not bow to social pressures but to look at reality when working, playing and living in areas where these creatures live. By and large, most Sasquatch seem to be good, but there have been plenty of cases of them kidnapping children, women and men and many reported cases of them consuming humans as related by many cultures and peoples. I believe these cases of humans being eaten are cases where either the Sasquatch are sick, starving or have acquired a taste for people for whatever reason. In all of these cases, I believe the government SHOULD seek these creatures out and destroy them for the common good. See cases of the Special Forces having had terrible battles with these creatures as well as stories of Native Americans relating their battles with Sasquatch in their legends. As started earlier, no one should go into the forest or wild unarmed if at all possible. One must play by the rules in certain state or federal parks which often restrict weapons in their boundaries. In such cases, carry what is legal like bear spray. Some deterrent is better than none. This is my personal belief and it will not be changed with comments to the alternative so don’t waste time trying to contact me to argue the point. If these people wish to go out unarmed and be victims of circumstance, that is their choice and they accept that they are releasing their fate to chance, fortune and the mood of other humans or creatures they encounter. Far be it for me to prevent these foolish people from being seen as prey and being prime recipients of the Darwin Awards. I have had many encounters with humans who respected my ownership of weapons and which aborted what likely would have been a bad or even fatal encounter for me when they saw I was armed. Your personal safety is your responsibility and your lack of it is also your responsibility. It is that simple. Sasquatch do understand the gun and respect what it does. They don’t like getting shot anymore than the next creature. They do respect and even fear us and the deadly potential we harbor. Mutual respect keeps the peace. Lack of it leads to violence. 10. YOU ARE PART OF NATURE AND THEREFORE PART OF THE FOOD CHAIN. RECOGNIZE THIS. By simply going outdoors, you are putting your life in your hands. Accept the responsibility for your life and don’t put it on others to safeguard yours. And when you walk in the woods, you are walking in Nature. She can be kind, caring and wonderful and then in an instant violent, cruel and deadly. There is no “fair” in any of this. You accept this whether you knew it or not the minute you started your camp out, your hike or your new home site next to the national forest. The bottom line is that you AGREED to abide by these rules whether you realized it or not. Argue as you may, you are part of Nature when you are in the World and not apart from Her. Recognize this and know your place, your limits and develop skills and awareness to maximize your chances in the outdoors. The bottom line in all of these rules is SITUATIONAL AWARENESS. This is the final rule and the one that the preceding ten all depend on. 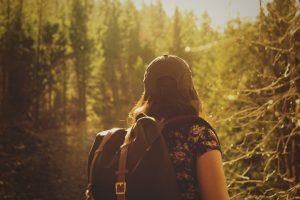 It is that unique ability to be aware of your surroundings and to understand when you may be in the territory of Sasquatch (and other predators) and that you are playing by their rules once you become aware (or not) of being in their presence and home ranges. A great number of people do not have this awareness when they are out in the world and should develop awareness. For many people, they run on autopilot and depend on others to be aware FOR them rather than to take charge of their own lives. Situational Awareness is an ability that one must cultivate and use at all times, whether in the forest or going to the supermarket or stepping out your front door. Simple awareness of my surroundings has saved my life on many occasions. It is a necessary survival skill and one I continually try to hone. In parting, it is up to you to control these interactions when they occur. Your actions dictate how the interaction will go down. If you create good will by giving Sasquatch their space, they will do the same in most cases. I hope this article helps you and will update it as my research reveals new information. We are scheduling our first 2018 gathering to go over the selected cases for this year. As many of you know, we do not often do investigations for clients, but instead concentrate our efforts on visiting historical sites, unusual haunts and cases which have achieved attention that we might be able to shed new light on, such as accident cases, missing persons, unusual paranormal sightings and more. We are also scheduling training missions and will post these soon for interested parties to join if they wish to see us in action. Without getting into too much detail, we are going to be testing new types of gear and taking our skill sets as a team to places we’ve never been. Our goal this year is to develop new technical and procedural capabilities to bring to our investigative suite. Our cases will thus be pushed into new areas that we feel will push the boundaries of the technology we use and will see us in environments that you normally wouldn’t expect investigations to be done in. We will soon post a schedule of our public cases and also summaries and case reports plus evidence collected as the year progresses. Get ready for a fun 2018 season! And Happy New Year! 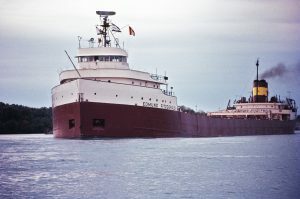 I recently came across mention of the 728 foot long Edmund Fitzgerald, a huge freighter ship that sank on November 10, 1975 in the largest storm ever seen on Lake Superior. The ship had twenty nine men aboard and all lost their lives when the ship suddenly experienced a catastrophic failure (likely from taking on too much water in extremely high seas) that took her under and split the ship into two pieces and left only floating debris and an oil slick as the only evidence of the accident. In 2012, the first body of a crewman was unexpectedly found by an expedition that used submersibles to explore the wreck. The body was found outside of the ship and evoked great emotion on the part of those who found it as well as the surviving family members of the Edmund Fitzgerald crew members. 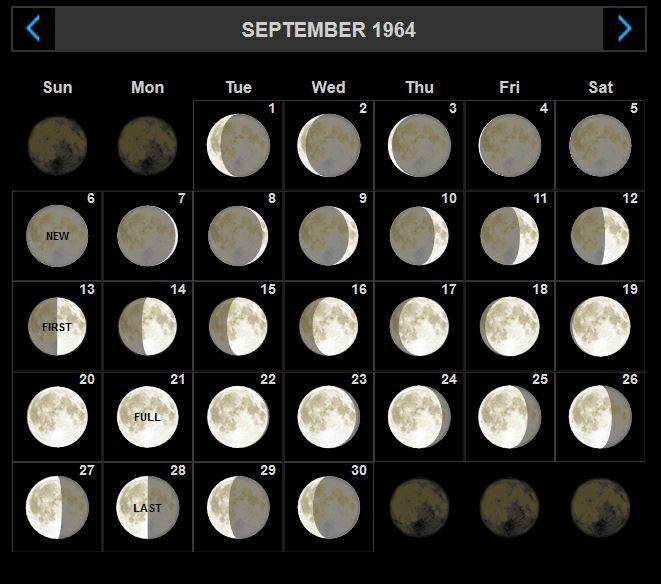 It was a sad reminder of how quickly these men perished and how Nature and Spirit will remind us of such tragedies with reminders years after the event has occurred. The discovery of this man’s body, so many years after he passed, got me to thinking if these sorts of wrecks are haunted and can provide clues as to their passing with EVP investigations of them. I have long held to my own theory that EVPs may offer insight into accidents, criminal acts and unexplained passing or disappearances of people. I believe that this should be an area that we focus investigative work to try to give clues and insights into such cases that otherwise would NOT be solved. I’ve seen evidence of EVPs showing up in all manner of television and YouTube videos with the people filming the clips never realizing what they captured and I suspect that spirits would gravitate to and communicate with this side to a recorder or video lowered into the site of their passing. The question is thus: Will they record to a microphone at depth or to a recorder lowered to the sea floor? I want to test this theory with both a hydrophone and a sealed enclosure to send down a recorder to see what we get. In 2018 I would like to find an underwater wreck to investigate somewhere in my travel area to test this theory. The idea is to lower a sealed microphone (hydrophone) or EVP recorder to the bottom to record EVPs at an actual wreck to see what we get. My expectation is that we WILL get EVPs and lots of them. 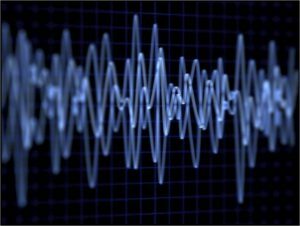 The key is to send equipment into places where paranormal researchers could never go safely and using low-cost electronics adapted to those environments to get the evidence for us. As such, I have a lot of equipment to be working on this winter to get ready for the Spring and Summer paranormal hunting season. The question is now to find someone with a boat, ROV gear and the willingness to work with a paranormal team to try some new types of investigation work. We’ve identified several sites of interest for this and a number of other missions for the 2018 season. More to come soon! to listen to our giant EVP library and view our considerable library of case files!